Watercolour on paper, signed lower lh corner. 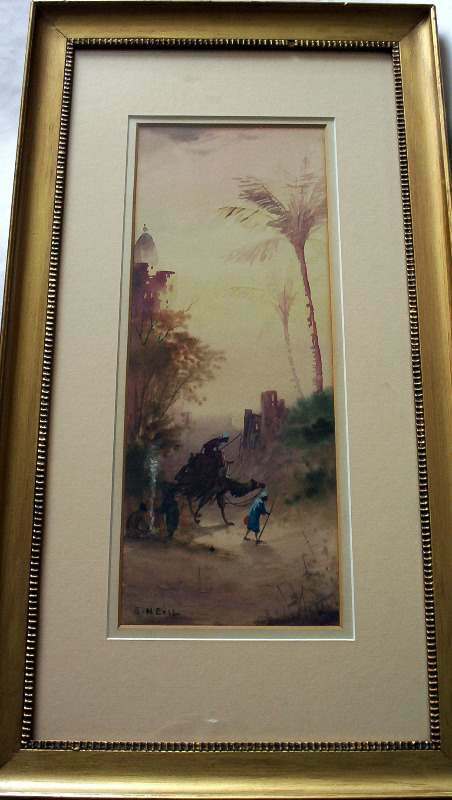 Dimensions : Frame : 602mm x 338mm x 23mm. Image : 392mm x 148mm. Weight : 1.680kg net. Condition : Good. 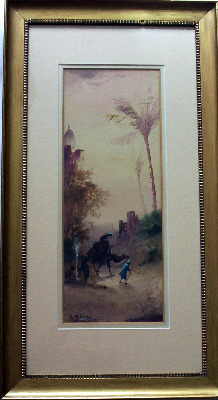 Arabian Scene with Figures and Camel, watercolour on paper, signed E. Nevil (Edward Nevil, Victorian watercolourist, prolific 1880-1900), c1890. Framed and glazed. Dimensions : Frame : 602mm x 338mm x 23mm. Image : 392mm x 148mm. Weight : 1.680kg net. Condition/Notes : Good. The watercolour on paper painting depicts an Arabian scene with figures around a camp-fire and a passing camel with rider. There is a chill in the evening air and the last rays from the setting sun are reflected from the mosque to the left of the composition. 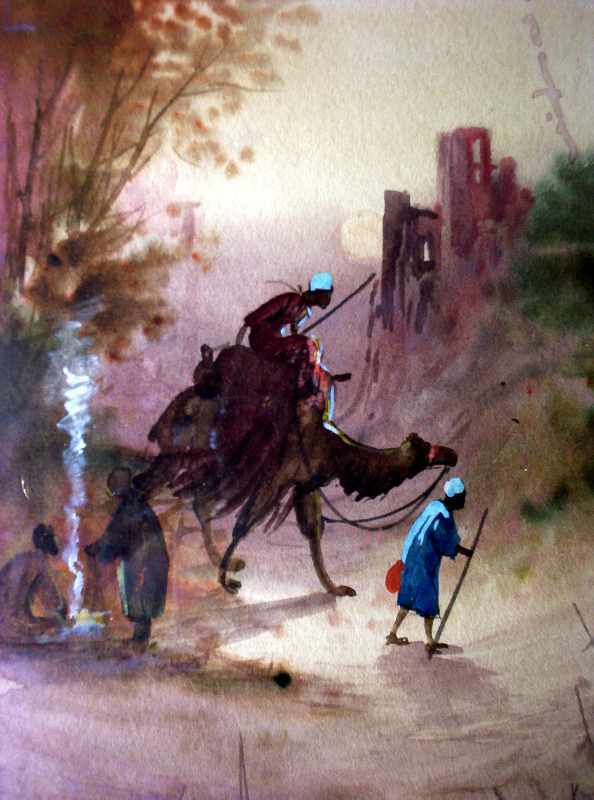 The passing figures are highlighted with gouache tints and the rising smoke from the fire emphasizes the stillness of the air. The colours of the study are typical of the works of Nevil although the subject is a departure from his usual English or Continental landscape/townscape views which can be more commonly found. The painting is signed E. Nevil in the lower lh corner in the artist's usual manner and is displayed within a grey and beige double mount. The inner mount has toning to the cut edge whereas the outer mount has a white window edge; both are in good condition. The gilt wooden frame with decorated inner edge is in good condition although one small 5mm section of the decoration on the upper edge is missing. 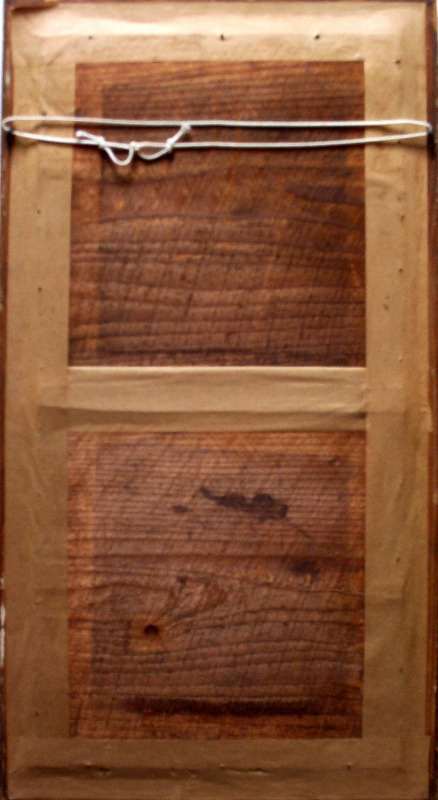 The frame is closed with two sections of box nailed in place and sealed with 50mm gummed tape. Large screw-eyes and cord attached. An attractive and unusual work by this well-known Victorian artist. Shipping Bands : UK : Fixed Rate 3. Europe : Fixed Rate 4. World : Fixed Rate 3.